The metastatic spread of cancer accounts for 90% of all cancer related deaths. Cancers may metastasize either via the blood and target distant organs (such as the lungs and bone marrow) or via the lymph and lodge initially in local lymph nodes. 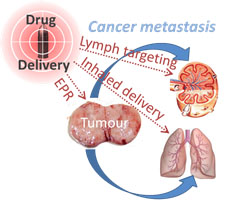 Currently, the pharmaceutical management of metastatic cancer is via the intravenous administration of small molecule chemotherapeutic drugs that distribute throughout the entire body, leading to severe drug related side effects with no guarantee of killing the cancer. Lisa’s research is therefore focused on using nanotechnology and drug formulation approaches to improve the treatment of metastatic cancers by: 1) developing nanochemotherapeutic platforms to enhance the delivery of cancer chemotherapy drugs towards primary tumours and sites of cancer metastasis; 2) optimising the biopharmaceutical properties of protein-based cancer therapeutics and immunomodulators to maximise exposure to lymphatic metastases. To this end, her lab specialises in characterising the lymphatic and tumour biodistribution of novel nanochemotherapeutics and PEGylated proteins and in evaluating the biopharmaceutical behavior of inhaled chemotherapeutic nanomedicines. In addition to being a major pathway by which cancers spread throughout the body, the lymphatic system is also the site of pathogenesis for a wide range of infections and hard to treat diseases (such as HIV and filariasis). In most cases, lymphatic diseases are treated ‘via the blood’ with small molecule drugs that inefficiently access the lymphatic sites of disease progression. This problem can be overcome by increasing the effective size of the drug, through either polymer modification or association with a nanosized drug carrier. Lisa’s lab is involved in evaluating the lymphatic exposure of drugs with indications against lymph-resident diseases and in maximising drug exposure and activity. With increasing interest in the development of inhalable nanomedicines, there is a growing emphasis on understanding how, and how rapidly inhaled nanoparticles are ultimately cleared from the lungs. Lisa’s lab has expertise in characterising the mechanisms by which biodegradable/bioerodible nanoparticle and colloid-based drug carriers are cleared from the lungs and the impact of lung disease on the clearance kinetics and pathways. A gender bias in biomedical research has been evident for decades, where drug development has traditionally been undertaken using predominantly male cells and subjects. However, gender and the female hormone cycle can have profound impacts on the pharmacokinetics of many small molecule drugs which can affect drug activity and toxicity profiles. It is for this reason that women generally experience many more adverse drug reactions than men. This is also true for some macromolecular drugs and nanomedicines, including protein therapeutics and liposomes. At present however, little is known about the biological processes that drive gender differences in the pharmacokinetics of macromolecular drugs and nanomedicines, although this will become increasingly important with the rapidly expanding ‘nano-drug’ market. Lisa’s lab is therefore also focussed on understanding why the pharmacokinetics of some macromolecular drugs and nanomedicines differ significantly between males and females, and in identifying whether the magnitude of this effect can be predicted prior to clinical trials.